Those unfortunate individuals diagnosed with COPD, or chronic obstructive pulmonary disease, are naturally concerned about their COPD disease. If you’ve been diagnosed with COPD, or are a care giver for someone with it, then this site is for you. You might want to know the most likely course and outcome of COPD, how best to treat it, what are its signs and symptoms, are there any cures, how can you manage it and feel comfortable. This site is all about researching and finding answers to the most asked questions that patients and their carers ask. The term COPD refers to a condition whereby individuals suffer from severe emphysema (dysfunction of lungs and damaged lung tissues) or severe bronchitis (inflammation of bronchial tubes lining), or both. Research has shown that heavy or regular smokers are more likely to suffer from this type of disease. COPD basically indicates damaged airways of a person’s lungs. Thus, individuals diagnosed with COPD usually experience symptoms such as chest congestion and shortness of breath. Air pollution, smoking, alpha-1 antitrypsin deficiency and chronic lung cancer are other factors which can contribute toward developing COPD. Taking into account all the factors likely to affect condition of persons diagnosed with COPD and the treatment available, medical experts try to give a prediction of what is likely to happen. COPD prognosis enables a person to know the course and the likely outcome of the ailment and thus offers information on the various prospects for recovery. COPD prognosis and life expectancy normally vary from one patient to another. This is due to the fact that the rates of destruction of the lungs usually vary from one person to another. COPD prognosis assists a person to know the possibilities of complication of COPD. Pathophysiology of the COPD usually is very complex and thus it may prove a little bit tricky to be identified. 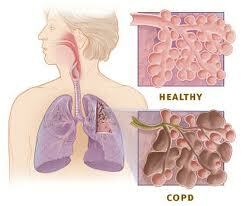 COPD treatment basically is so designed that it assists avoid complications such as pneumonia. It also assists in increase life expectancy of the sufferer by enhancing the quality of his or her life. After the doctor looks at the spirometry test, which is a test performed in order to check the capacity of the patients’ lungs, he or she can determine if the person has COPD and also how severe it is. Let us now have a look at the various COPD stages. This is the initial stage of COPD development. Those people who smoke regularly are considered very likely to develop this condition. Those who frequently inhale smoke such as fire fighters are also likely to develop COPD. Breathing in chemical fumes, toxic gases and dust for many years can also contribute to the condition. There are some certain genetic factors that determine whether an individual will develop COPD or not. For example, someone suffering from alpha 1 antitrypsin deficiency, which is a protein type lacking in the blood, is more prone to suffer from COPD. This is because low levels of antitrypsin may seriously affect the functioning of the lungs. Symptoms of COPD disease include sputum production, mild airflow limitation and chronic cough. In case the COPD symptoms are mild, the condition does not cause severe health complications if the patient stops smoking when his or her airflow is just mildly obstructed. However, if the patient does not quit smoking, the symptoms are likely to worsen at a very faster pace. During this stage of COPD disease, a worsened airflow limitation and some increased symptoms such as shortness of breath while an individual is walking fast can easily be noticed. If test results are conducted at this stage, they will show worsening of this condition. Due to the airflow limitation, the patients will require immediate medical attention. COPD symptoms may aggravate at this stage thus making the patient to experience difficulty in breathing each time he or she is working hard, or when he or she is performing strenuous physical workouts. This is the last stage of COPD development, during this stage the patient experiences shortness of breath, severe airflow limitation after only performing a little activity. Complications such as respiratory failure, signs of right sided heart failure are normally witnessed during this stage. Survival of persons with this type of COPD will depend upon their lung functioning level. Mostly, individuals who may have lost approximately two-third of their lung capacity during the time for diagnosis are likely to survive for approximately ten years. Despite the above named causes and stages of COPD, it is also ideal that we look at some of the available treatment options for this disorder. This is the very first advice given by doctors to patients suffering from this condition. Cigarette has toxins which are capable of damaging a person’s lungs. Thus by quitting smoking habits, you may experience some immediate improvements in breathing patterns in your lungs if only they are not badly damaged. These are medicine types that usually dilate the passage of a person’s airways so as to reduce his or her breathlessness. These kinds of medications usually made in form of inhalers assist to expand constricted air passages in order to promote airflow in and out of the patients’ lungs. Generally, these medications are prescribed to asthma and COPD patients and basically work by easing breathing. Antibiotics are normally recommended in case the patient has got acute bronchitis as a result of bacterial infection. COPD patients will always be in high oxygen demand. This may be fulfilled easily by oxygen therapy, whereby the patient inhales air that contains 100 percent oxygen by the use of a specific device attached to his or her nose. This is whereby the tissues of the damaged lungs, which are as a result of COPD, are removed via surgery. This will help improve the functioning of the lungs and thus reduce difficulty breathing. Last but not least, COPD prognosis can vary from one person to another. Early detection accompanied by prompt treatment can assist prevent further growth of this diseases. It’s my sincere hope that this website about COPD prognosis will be of really benefit to COPD patients. You’ve Found Your COPD Disease Guide!